I'm starting to tire of the garbage coming out of "The City of Champions". This once-proud franchise has gone from Stanley Cup champions to perennial playoff warriors to laughing stock of the league. Sure, it's taken thirty years, but the downward spiral this team has been following has been nothing short of spectacular as they continually draft poorly, sign free agents that barely help, and continue to find themselves at the bottom of the NHL standings. While the players on the ice are responsible for the play of this team, it appears that the Oilers are headed for another top-five draft pick. It might be time for management to stop pointing fingers at others because they may be the trouble with this team. 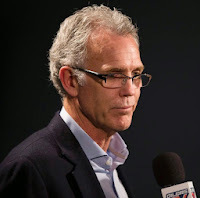 General manager Craig MacTavish basically begged fans to for more patience in his press conference because he wasn't responsible for the failings of Kevin Lowe and Steve Tambellini, according to the man himself. What has he done, though, to ask the fans to sit through another season of abysmal hockey while paying good money to support his lame duck franchise? Secondly, what gives him the right to point fingers at the previous regimes when he has done very little to correct the mistakes made by those general managers? Let's be honest in saying that if Craig MacTavish has any credibility whatsoever, blaming his boss in Kevin Lowe for this franchise's state of disrepair is gutsy. Pointing the finger at Steve Tambellini is an easy out since Tambellini isn't there to defend himself. However, MacTavish's message of "we won't trade core players" and "we won't trade draft picks" suggests that he isn't willing to cut the cords on players who are floundering and he certainly isn't willing to fix the team despite his assertions he will. Basically, Craig MacTavish's press conference today was similar to the landing of a hot air balloon: nothing but a lot of hot air being released with deflating results. The word "accountability" was used repeatedly today, but I can find none in the group of Kevin Lowe, Craig MacTavish, Scott Howson, and Dallas Eakins. While we're at it, we might as well throw Daryl Katz, the owner of the Oilers, into the mix as well. See, if Katz wanted to see his team succeed, he'd make changes. He's a guy who ran a chain of pharmacies, and I'm pretty certain that he'd fire a manager if they were as inept as the Oilers have been, but yet he does nothing. So here's what I would do since I give a damn. All four of the men listed above - MacTavish, Lowe, Howson, and Eakins - would be fired. We're going in a new direction that will change the course of the franchise, and I don't need dead weight. What you did in the past for the Oilers was great, but what have you done for me lately? Well, besides running this franchise into the ground? Yeah, not much. So you're all gone. I would hire Ray Shero as my new GM. You might be questioning that move, but it's not like he didn't retool the Penguins to be perennial favorites every year. And, based on how the Oilers are playing this season, they may have Connor McDavid on their roster next season. In any case, Shero would be hired to take the reins and start retooling this team through the draft, free agency, and trades. I'd replace Dallas Eakins with former Tampa Bay Lightning head coach Guy Boucher. Boucher coached the Lightning to a 97-79-20 record in just over two seasons, and that was before they started seeing their young players take major steps forward. Boucher's 1-3-1 system would be fairly easy to implement with the young Oilers and, given their propensity for offence, may work in generating additional offence while hiding some of their glaring defensive and goaltending woes. Boucher is said to be an extremely effective communicator, taking great pains to learn everything he can about every player on his team so he can deal with them on a one-on-one basis. "He listens to all his players, regardless of their status," said Canadiens prospect Gabriel Dumont, who played under Boucher in both junior and briefly this season in Hamilton. "He knows each player and knows how he needs to manage each player." While Ray Shero would be in charge of making personnel decisions regarding players, I'd insist that Nail Yakupov be either traded or sent to Oklahoma City. The kid simply has no clue what the word "defence" means. Or "back-checking". Or "teamwork". I'd almost insist he be traded, but his offensive upside could be huge if he could figure out how to play the game. However, the final decision would be up to Shero, so it might be time for Yakupov to keep his bags packed for next few weeks as Shero works to change the dynamic of this team. The last decade, led by Kevin Lowe, included Craig MacTavish for portion of it, and nothing has changed. Multiple coaches, free agents signed and discarded, trades made, and draft picks injected into the lineup have done nothing to change the fortunes of this team. Since it seems to be a recurring theme despite the changes on the ice and behind the bench, then the problem must lie in its roots. Like a plant, you can trim back the dead growth, you can water it, and you give it as much sunlight and plant food as it can handle in the hopes that the plant becomes vibrant again. However, if the plant is still dying you may have to look at the root system or even get rid of the soil and start over once more. The one thing you don't need to do? Keep piling the fertilizer on. And all the Oilers have done for the last ten years is give press conferences like today's MacTavish speech where they spew nothing but BS. I wouldn't mind the fertilizer, but this team has shown no growth on the ice. Maybe it's time to stop with the BS rhetoric and clean house.